This lovely mare was Reserve Champion Mare at the international Kumla show in 2005. However, she isn't just beautiful, she also competes in western with her owner Lena. She has had one foal, the mare Maiyah 2000 by Fynd. 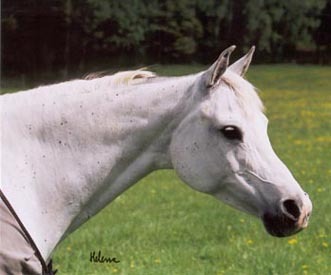 Her sire Balon PL was leased by Slängsboda Arabians and Blommeröd. While on lease in Sweden he was Swedish National Champion Stallion. 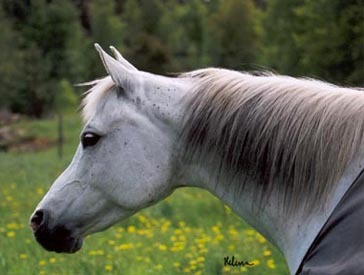 Minerva, her dam, was one of the best mares at Slängsboda. Mirva belongs to the damline of Sahara OA imp 1845 to Jarczowce. The strain is Kuhailan and the only direct line from Sahara OA is that from her daughter Sahara Slepka OA who was foaled in transit. Many members of this family perished in World War I and only two mares were saved, Pomponia 1902 and her daughter by Kohejlan OA, Zulejma 1914. After the war Pomponia had two more daughters, Dora 1922 by Bakszysz and Bona 1920 by Mazepa I. Of the postwar daughters, only Dora had any impact on the breed. Despite the sorry state this family was in after WW I it has since grown and is now one of the major families, both in quality and quantity. Zulejma 1914 founded three branches of this family through her daughters Dziwa 1922, Ferja 1924 and Huryska 1926. Dziwa would have been covered in glory if she only had produced Ofir but beside him she produced two other stallions, Taki Pan and Jezupol, and the mares Mokka, Limba and *Niwka. The mare Ferja 1924 produced four mares used in polish breeding. Her daughter Magja 1931 by Koheilan I was lost during World War II but left two daughters to carry on, Kaszma 1939 by Kaszmir and Imatra 1936 by Hardy. Imatra was the dam of Mimonka 1945 imp Sweden (along with her filly Mimoza by Negatiw). Before she was imported she produced the mare *Mimika by Ali Said, dam of *Mimikra by Comet and her full brother *Meczet. *Mimikra was an excellent broodmare and the dam of stallions Abu Ali (imp in utero, by Gwarny), Mexi and Mirex, full brothers by *Exelsjor, and the mares Al-Mida, Alma, *Algiemia, *Troisieme and Mialga.